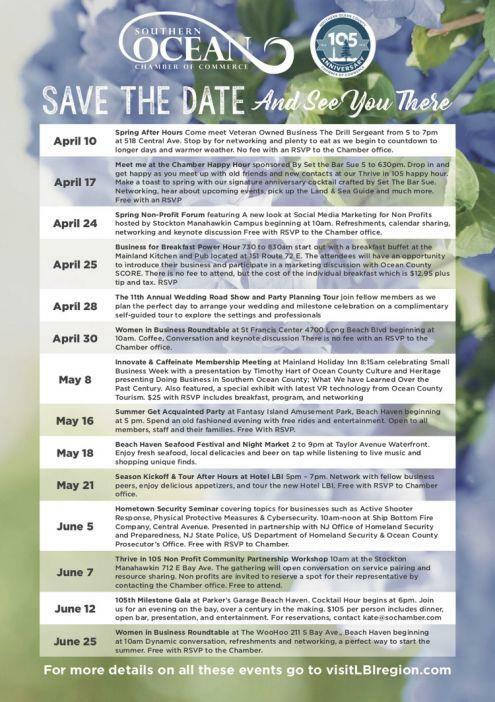 (MENAFN - PRLog) The 105th anniversary of the regional chamber brings a full calendar of business and social events to celebrate the arrival of Spring Doing business in the LBI region? Thrive in 105 with the Southern Ocean Chamber SHIP BOTTOM, N.J. - March 20, 2019 - PRLog -- Members of the Southern Ocean County Chamber of Commerce invite area professionals to take advantage of a variety of networking opportunities, chamber meetings and social activities geared to expand your business connections in the region. Celebrating their milestone 105th year, the organization is holding Thrive in 105 events with a Meet Me at the Chamber Happy Hour with Set the Bar at Chamber Visitor Center on April 17, May 8 Small Business Week Then & Now with Virtual Reality demo meeting, Summer Get Acquainted Party with free rides for members staff and their families on May 16 at Fantasy Island Amusement Park and the 105th Gala at Parker's Garage on June 12.